When I first got directions to the house of the woman who is now my wife, it was a little odd-sounding. Drive over to Cedar Bluff (aptly enough named, as a bluff is there, covered in cedars and other trees). Drive up Busthead (what? 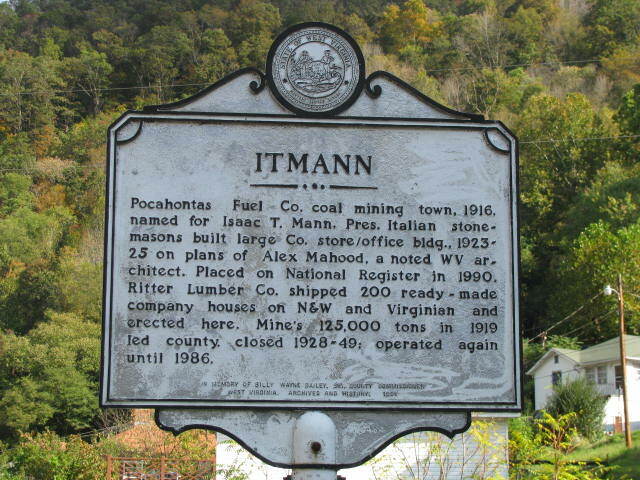 ), and turn left on the Amonate Road (Amonate was a name sometimes used for Pocahontas, and the little coal camp was named for her since it was a part of the same coal seam as the one at Pocahontas, above Bluefield). If you turn right at that intersection, in what I came to learn was “downtown” Busthead, you would be in “Baptist Valley.” But turning left, you found yourself in the Bandy community. I found my wife’s mother’s family were Bandys. In Bandy, there is a road to the right that goes “up Sinking Waters.” You never come down Sinking Waters, you always go “up.” I’ve heard people say when you come out, you’re “coming out of the holler” (hollow). If you go on up that road, you can find access to Creed Branch, and if you continue past that road, you will go over the “Little Jumps.” This leads you to the neighborhood of Salem Primitive Baptist Church and the Dry Fork Road. You can take the “Big Jumps” back up into Baptist Valley if you’re so inclined. But I wouldn’t recommend it. In Bandy proper there is a railroad underpass near the school house. I always like to say that on this side of the underpass is Bandy, and when you go through the underpass, there’s Mo’ Bandy! If you go on through that underpass, you can turn left to go over around Raven’s Nest Branch, or stay on the main road and take a turn up Whitaker Ridge, or go up Panther Branch, or Greasy Creek, or you can stay on the Amonate Road and cross Tunnel Hill on your way to Amonate and the Beach Fork community, which gets you back over in West Virginia. Another little coal camp is located across Stony Ridge from where Dry Fork road comes out on the Adria road. That’s the community of Bishop. We have three Methodist churches around there on one circuit (meaning they share one preacher). We like to tell the preachers there that they’ve finally made it to bishop. If you continue on past Bishop, you end up in Anawalt, drive through Squire and Cucumber, and come out at War. If you’ve never been to War, you should try it. Then you can tell folks you’ve been to War and back. Of course you can also go to Coalwood and Caretta, Berwind, or Canebrake. Or you can climb a hill at Bishop and go through Grassy Spur. Over in Buchanan County, the nextdoor neighbor to Tazewell County, are little places like “Drill,” “Contrary,” “Big Rock,” “Slate Creek,” which leads to Bradshaw Mountain, and Jolo. Jolo was the first place I ever knew where they handled snakes. And that was on TV cameras. Now when I hear “Jolo,” I think of snake handling. Up around Bluefield you can find yourself in places called “Falls Mills,” “Yards,” “Nemours,” and “Peeled Chestnut,” on your way to the little big town of Pocahontas. After that is Boissevain, Abb’s Valley (named after a man who’s first name was Absolom), and Mud Fork. Between there and Springville is Tip Top, the highest point on the Clinch Valley Railroad. Coalfield communities are either named for people who were developing the coal or railroad, or they bear names of geographical features. Thus, Bluefield (ostensibly named for the limestone that is prevalent in the Bluestone River) was once called “Graham,” after Thomas Graham of Philadelphia who came into the area as a carpetbagger and “discovered” the Flattop Mountain coal seam. He developed the New River Railroad line to exploit this resource, and the towns of Pocahontas and Graham were developed in relation to that. Graham changed its named in 1924 to Bluefield to match its sister community across the West Virginia state line, which had become the larger community since the railroad yards were located there. Coeburn is a contraction of two coal developer names, Coe and Burns. The names Berwind, Gary, Iaeger, Bramwell, Jenkinjones, Vansant, Davenport, Hurley, Leemaster, Patterson, Clintwood, Fremont, Haysi, Nora, Dryden, Elydale, Keokee, Norton, Esserville, Inman, and Dante (which is pronounced here “daint”), are just some of the Southwest Virginia and Southern West Virginia towns that are named for people, either coal developers or family members of postmasters. In my mountain region, we give emphasis on the first syllable of names. St. Paul and St. Charles are pronounced “SAINT paul” and “SAINT charles.” Knoxville and Richlands are pronounced “KNOX-vuhl” and “RICH-lands.” Lebanon is “LEB-nun.” It’s always fun to hear young newscasters and meteorologists who move to the area try to pronounce places. Honaker usually gets them and Haysi. We say “HOE-nake-er” and “HAY-Sigh.” And of course, “Apple-AT-ya” instead of “ap-uh-LAY-sha.” How you say it gives us huge clues about where you’re from. As with all your columns this is very interesting and well written. Place names everywhere are so interesting. I used to travel to mines in some of those places you mention and just the mention of the names brought back memories. Bishop, I remember. I went to Amonate Mine and, rode a rail car through the mine and it actually went through a mountain to the outside and then back into another mountain. One side was in West Virginia and the other was Virginia, I remember the mine foreman saying. Your good writings are much appreciated. It’s great to read about the history of local names of communities…………local history is my favorite.